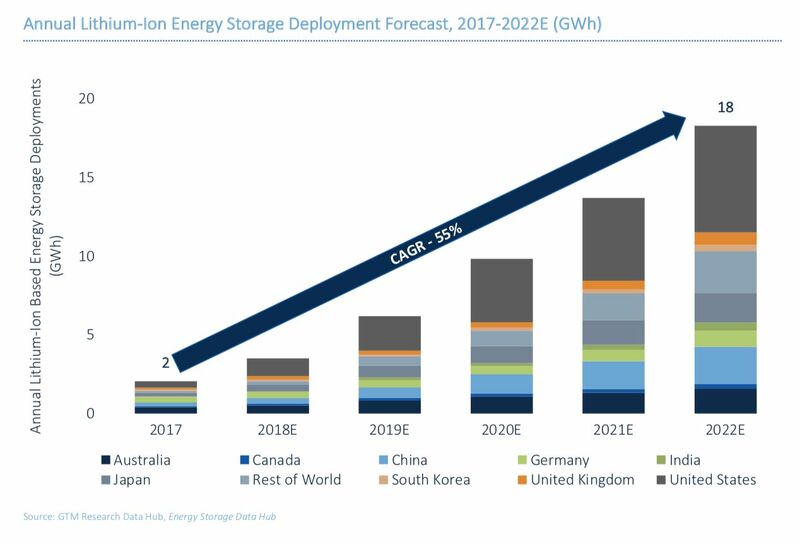 There's a broad consensus that the world will deploy more grid storage in the coming years than it does today, but few people agree on exactly how much more. 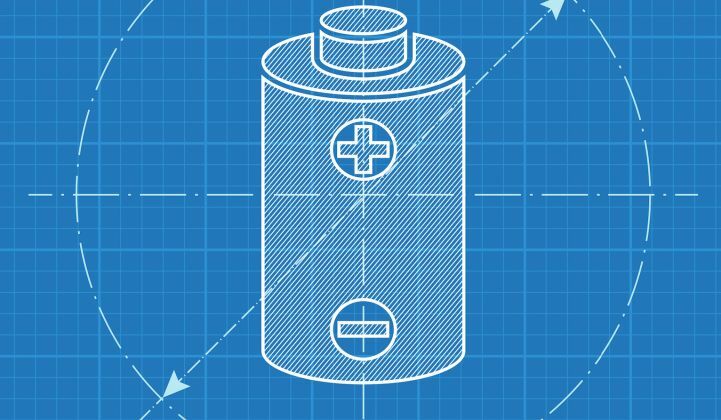 Here's a new prediction: Global lithium-ion battery deployments over the next five years will grow by 55 percent annually, according to a new report from GTM Research. In other words, annual lithium-ion installations will grow more than eightfold, from 2 gigawatt-hours in 2017 to 18 in 2022. This growth is starting from a tiny baseline — for comparison, electric-vehicle sales produced demand for 112 gigawatt-hours of batteries in 2017 alone. With 55 percent annual growth, though, grid storage will soon be substantial enough to alter the performance of electrical systems around the world. The U.S. will continue to lead the pack in deployments, followed by China, Japan and Australia. The investments that states are putting in now with early battery projects, market reforms and storage mandates will bear fruit over the next several years. That pioneering work, though, enables other countries to follow more quickly and efficiently. Whereas U.S. grid planning varies wildly across each of the 50 states, centralized policy formation in countries like China and South Korea allows for rapid uptake. The accelerating deployments are made possible by a flurry of interconnected trends. The demand for EV batteries has incentivized a massive build-out in production capacity, which reduces the cost of batteries for grid applications. Meanwhile, lab research continues to improve energy density by tinkering with the optimal combinations of anode, cathode and electrolyte materials. Once electric cars have had a few more years on the road, their used batteries will become cheap, secondhand stationary storage devices. All told, authors Mitalee Gupta and Ravi Manghani expect battery pack prices to fall from $219/kilowatt-hour in 2017 to $39/kilowatt-hour in 2040, an 82 percent reduction. The cost of storage has thus far limited its use on the grid to a small number of special cases. As the cost plummets, a much wider range of use cases will become attractive. During that same time period, growth trends for wind and solar power will increase the value of assets that can store electricity. The question then becomes what effect the influx of batteries will have on the rest of the grid. Australia's first large storage system, for instance, has already lowered pricing in key grid services markets. Batteries could start economically displacing new and existing gas plants for peak power in Australia by 2025, and then begin challenging gas for bulk power by 2035, according to research published last year. California legislators are mulling a complete phaseout of fossil-fueled electricity by 2045, in which case batteries would almost certainly become the lead provider of flexible capacity. Whether battery deployments and cost declines are on track to assist in decarbonization efforts without great expense is another matter. The trend, at least, is pointing in the right direction.